Homemade pineapple upside down cake is a true treasure! No box cake mix here, this is made completely from scratch and results in a light and moist cake topped with a caramelized pineapple topping that seeps down into the cake. A true classic, this recipe is perfect for any of your spring and summer special occasions! It is officially April, which means spring has sprung and I am ready to embrace all of the light and refreshing desserts that the world has to offer. Enter pineapple upside down cake. This is an absolute classic and it seems every family has their own favorite recipe, and this is mine. Caramelized pineapple slices sit atop a light and moist, almost sponge-like, yellow cake that is infused with pineapple juice for a real pineapple treat! Absolutely the best pineapple upside down cake I’ve ever set fork on, and I’m thrilled to share it with you today. You only need a handful of ingredients to make a classic pineapple upside down cake. Butter + Brown Sugar: These combine in the bottom of the pan to create a caramelized coating for the pineapple when the cake is turned out. Pineapple Slices: A must! 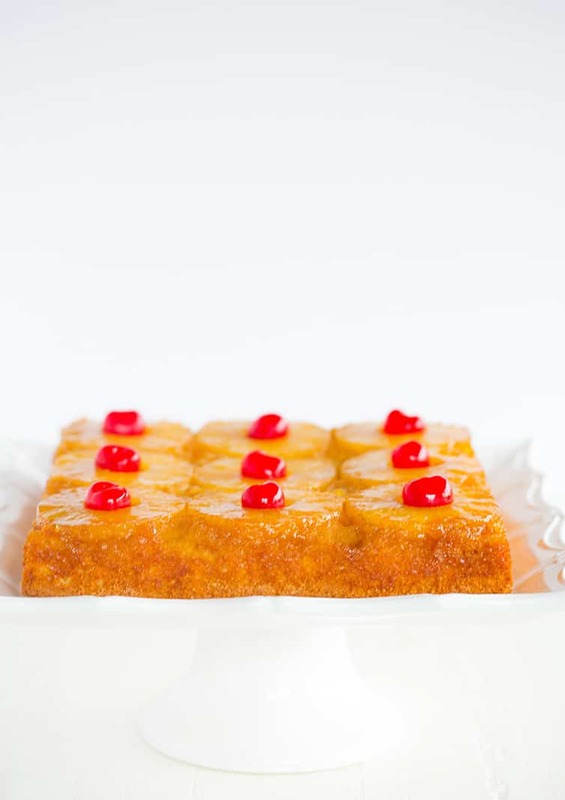 This is pineapple upside down cake, after all! Flour: Creates the base and structure for the cake. Baking Powder: Baking powder gives the cake its rise. Eggs: The yolks provide richness and bind the batter together, while whipping the whites separately and folding them into the batter creates extra lift and tenderness in the final cake. Granulated Sugar: Sugar in the cake batter adds sweetness to the cake, and also helps to provide structure to the finished product. Pineapple Juice: Extra pineapple flavor, which most pineapple upside down cakes are sadly lacking! Vanilla Extract + Salt: Flavor, flavor, flavor! Maraschino Cherries: For a pretty pop of colors along with the pineapple. If you’ve never made this from scratch, fear not – it is a simple and straight-forward process! Combine butter + brown sugar: You can stir these together in the bottom of the pan and push the mixture around to create an even layer. 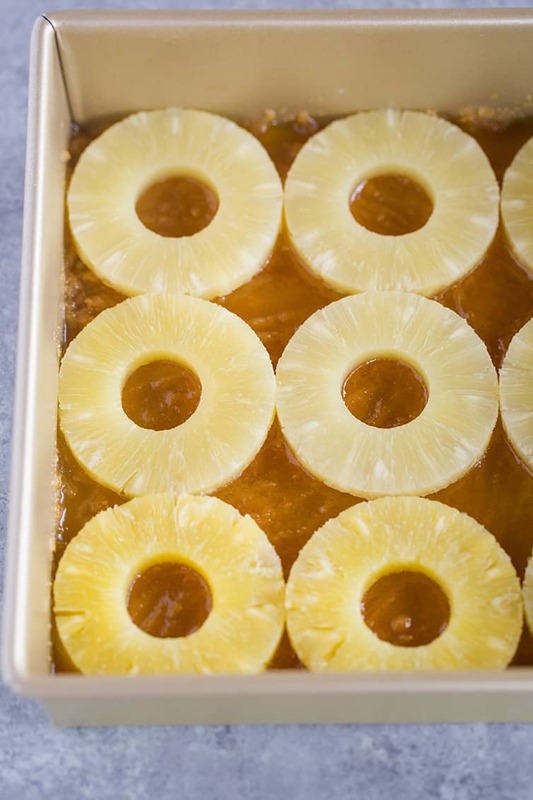 Place the pineapple slices: Lay the slices down in three rows over top of the butter/sugar. If you use canned pineapple slices, they are sized so that three rows of three fit absolutely perfectly in a 9-inch square pan. Beat the egg yolks + sugar: Beating the egg yolks until thick creates volume and ensures that the cake will not be dense. Add the pineapple juice, vanilla, and salt: Mix these in until combined well. Dry ingredients: Whisk together the flour, baking powder, and salt, then add to the egg mixture and beat on low until combined. Whip the Egg Whites: In a clean bowl with clean beaters, whip the egg whites until stiff peaks form, then gently fold into the batter. Spoon: Spoon the batter into the pan and spread into an even layer over the pineapple slices. Bake: Until a toothpick comes out with just a few moist crumbs. Allow to cool for 10 minutes in the pan. Invert: Turn the cake out onto a serving platter and place the maraschino cherries into the center of each pineapple slice. Keep a jar of sliced pineapple in your pantry and a jar of maraschino cherries in your refrigerator for a quick and easy dessert anytime you need something that’s beautiful, delicious, and doesn’t take a tremendous amount of time. 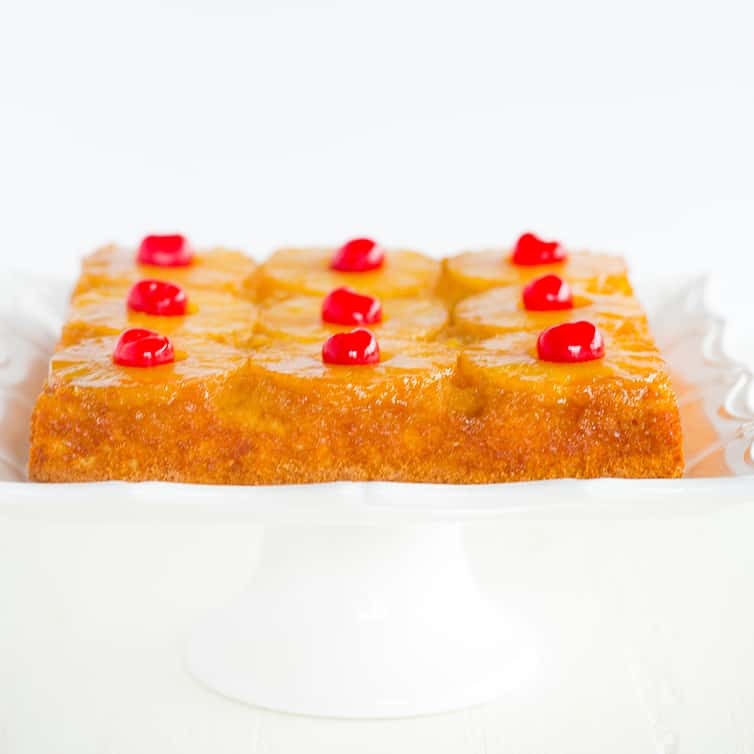 Whether you need something sweet to cap off Easter or Mother’s Day, or are simply looking for something to transform a weeknight dinner into something special, this pineapple upside down cake is the answer! If you love this pineapple upside down cake, you won’t want to miss these other cakes that are perfect for your spring and summer celebrations! 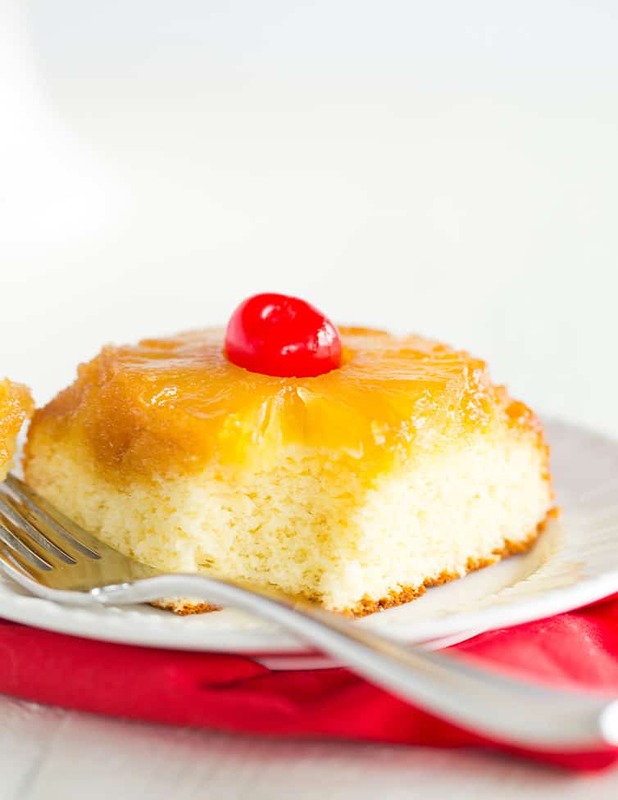 This homemade pineapple upside down cake is made from scratch, comes out light and moist, and is perfect for any spring or summer special occasions. In an ungreased 9-inch square baking pan, combine the melted butter and brown sugar, spreading it into an even layer. Arrange the 9 pineapple slices in a single layer over the sugar mixture. In a large bowl, beat the egg yolks on medium speed until thick and pale yellow, about 3 minutes. Gradually add the sugar, beating well until completely incorporated. Add the pineapple juice and vanilla extract, and blend to combine. Reduce the mixer speed to low, add the flour mixture, and beat until just combined. 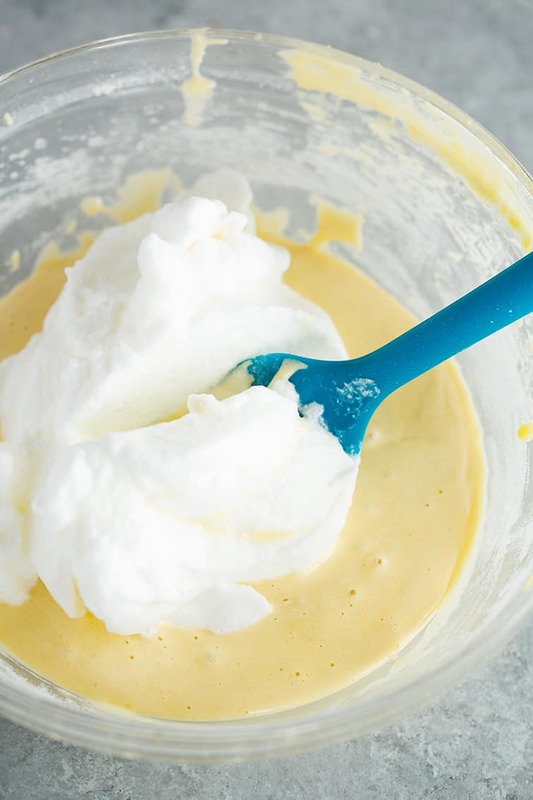 In a clean medium bowl with clean beaters, beat the egg whites on medium-low speed until frothy, then gradually increase to medium-high speed and beat until stiff peaks form. Gently fold the egg whites into the egg yolk mixture until no white streaks remain. Spoon the batter into the pan, spreading it evenly over the pineapple slices. Bake until a toothpick inserted in the center comes out clean, 28 to 32 minutes. Allow to cool for 10 minutes, then invert the pan onto a serving dish. 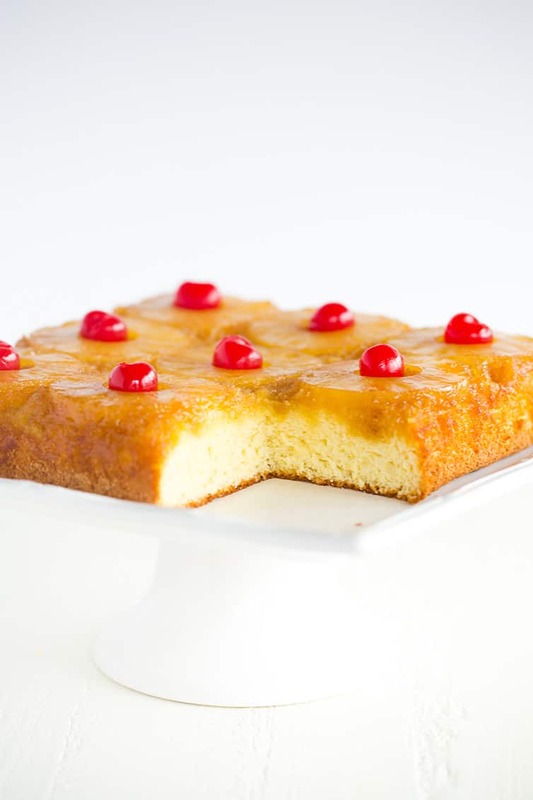 Place a maraschino cherry in the center of each pineapple slice. Use a 20-ounce can of sliced pineapple for this recipe - you will have enough slices for the cake, and enough juice needed for the batter, as well. Update Notes: This recipe was originally published in September 2009 and updated in April 2019 with an improved recipe, new photos, and loads of recipe tips.